The main key to this recipe is you don’t need to chill the dough as you go, but you can if your kitchen is particularly warm. It’s a recipe you can do all the way through, and then have it ready to go when you want to bake a pie. After the Chiplet was born, I made this pie crust and then saved it for dinner the next day when we made a quiche I will share tomorrow. The original recipe emphasizes the temperature of the dough over and over. I tried to follow that the first time, but after that it was too annoying and I just ignore that. If you want to check the temperatures the first time you make it, then again, you can go to the website to see the specifics. Whisk together the flour, sugar, and salt in a bowl. 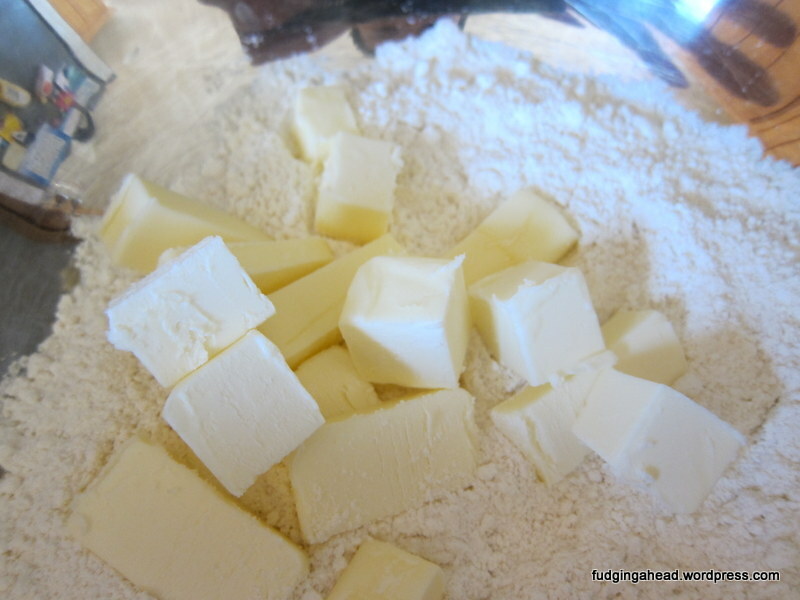 Cut the butter into 1/2-inch cubes and add to the flour mixture to lightly coat the pieces. Then, use your fingers to smash each butter cube flat. Stir in the water, then knead the dough in the bowl until it becomes a rough ball. Roll the dough into a 10 inch by 15 inch rectangle on a floured work surface. Fold the 10-inch sides to the center, then fold the dough like closing a book. Bring the short sides together, folding in half again. Cut the dough in half with a knife or bench scraper. For a single-crust, roll one of the halves big enough to drape across your pie plate (14 inches for a 9 inch pie plate). Use as much flour as you want, but brush off the excess with a pastry brush, and use the brush to gently nudge the dough into the corners of the pan. Trim the edges so that the overhang is 1.25 inches. Fold the overhang onto itself, then crimp as desired. Cover with plastic wrap and refrigerate for at least 2 hours before using. For a double-crust, repeat the single-crust dough steps with one half, then roll the other half into a 9 inch by 15 inch rectangle to cut lattice strips, make decorations, etc. later (unless you are doing another circle for the top). Place on a baking sheet and cover with plastic wrap. Refrigerate for at least 2 hours before cutting and using it.